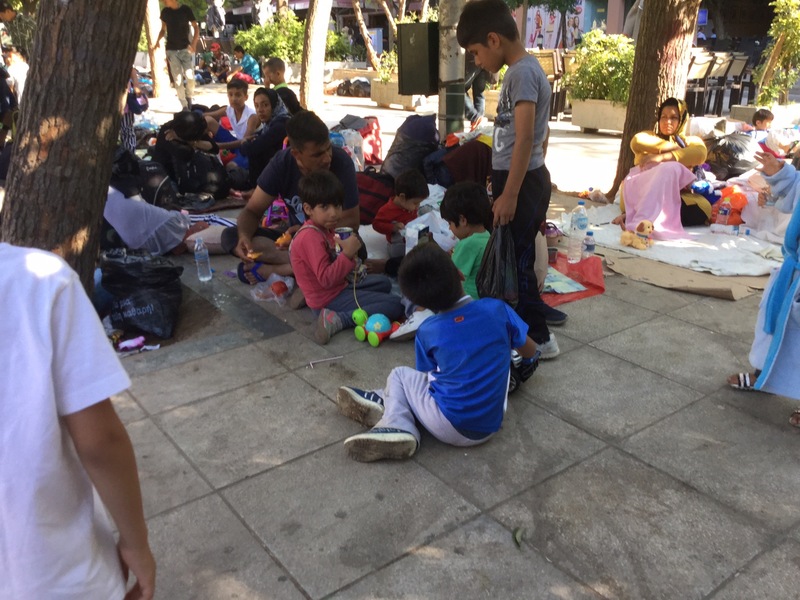 September 2015, Athens. The world is my classroom and my classroom was most recently located in Greece for 3 weeks. My time in Greece was amazing! While in Crete, I read about the Minotaur and then played with my brother in the Minotaur’s labyrinth. In Santorini, I had science in the middle of the most beautiful volcanoes in the world, and art with a 5th generation pottery master. In Athens, I walked up the Acropolis to one of the most famous structures in the world: the Parthenon built for the goddess Athena. Athens, I learned, was the birthplace of democracy, philosophy, theatre, medicine, the alphabet, architecture …it’s just like the man in My Big Fat Greek Wedding said everything truly does come from the Greeks!!! Even with an economic crisis, I saw the beauty of Greece. Life was good until my mom thought we needed to learn about modern politics. I don’t even know what that means! We had learned about the Trojan War, and my mom told us there were wars going on today. What!? That’s crazy and soo sad. With the help of an Athenian, we arrived at Victoria Square in Athens. 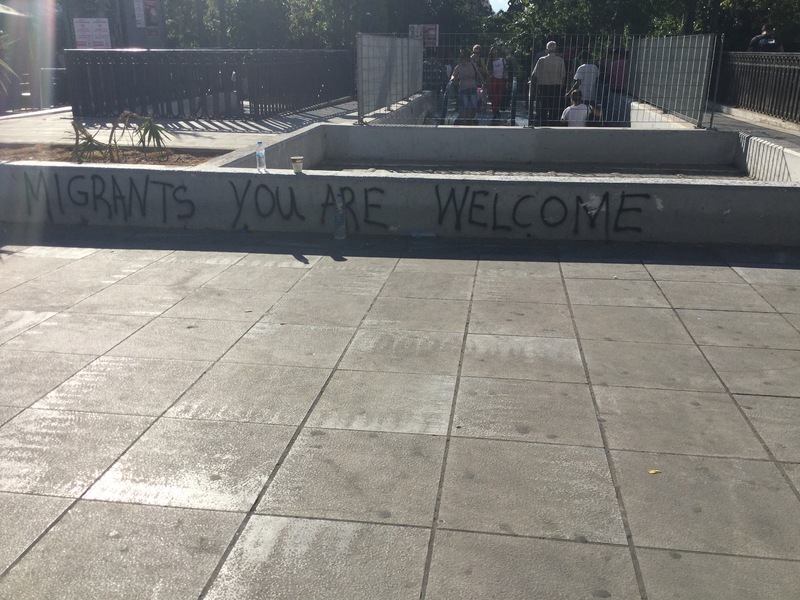 “Migrants you are welcome,” spray painted in the town square. We were told this was the place where the refugees who didn’t have the proper paperwork to cross the border were living. Sometimes pictures are more powerful than words. I saw that the kids were playing together and the parents were very sad. I also saw that their beds were made out of cardboard boxes. One boy said that his family was killed and he wanted to get to Germany but he couldn’t because the borders were closed. I passed out ice cream and croissants to the kids. They were really happy. My mom showed me a video of Greeks in the islands helping the refugees. Please watch below. We went back to this square a few days later and talked with men who had lost their entire family. 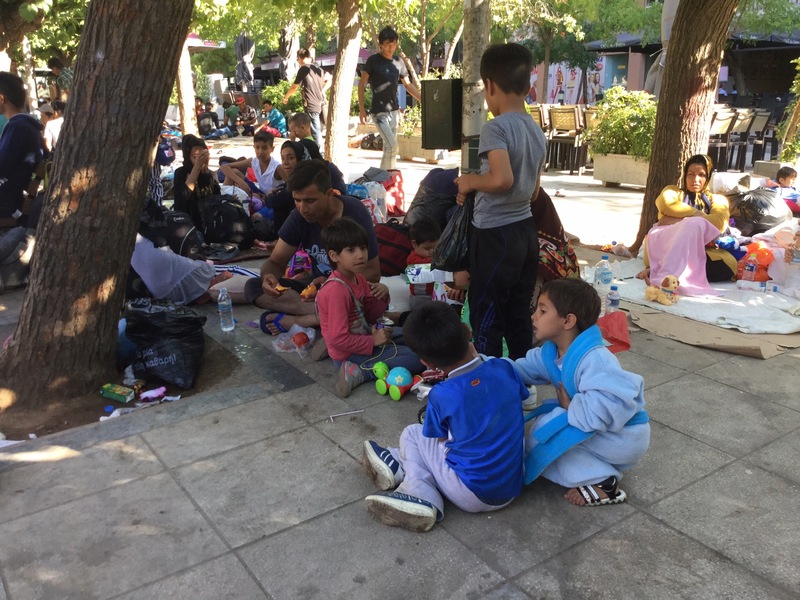 These men told us they were stuck in Greece because the borders were closed. They were starving. While we were there, Athenian women came by to give food to these men. When we left the refugees, my mom and I talked about the Golden Rule. Did the Greeks invent that too? What would we want others to do if it was too dangerous for us to live in our home? Greeks, I learned, will help others even when they are suffering. The Greeks were helping during their own time of struggle. Greek generosity was more impressive than the Acropolis, more beautiful than Santorini. I learned the true beauty of Greece came from the human spirit of the Greeks themselves, from my Thea who was so generous to our family to the Greeks I saw helping the refugees. You are so lucky to have seen and traveled to Greece. Beautiful! I couldn’t agree more Noel! This is so beautifully written and so profound to read. I am glad to hear about your personal experience since we only hear stories on the news. Thank you for sharing your stories.